Amid concerns mounting over Russia's military actions in Syria and rising global fears about the possibility of another Cold War, US military officials in the Pentagon are dedicating their efforts to make sure Russian submarines do not try to cut the essential undersea internet cables that countries, governments and citizens. US intelligence officials report that they have seen significantly increased numbers of Russian vessels in the North Sea, north-east Asia and also in waters close to the American shores, particularly along the known routes of the undersea internet cables, according to the New York Times. In one incident, Russian spy ship Yantar, armed with two self-propelled deep-sea submersible craft, was detected cruising off the East Coast of the US in September, which is close to where one of the internet cables lands near the American naval station at Guantanamo Bay. The US Navy and Army are using spy satellites, ships and planes to monitor the situation but it is still concerned that Russian submarines could still manage to reach the seafloor miles below the surface and cut crucial cables with no one the wiser; other nations are worried too. How do you patrol huge oceans effectively? The ocean is a wide place and it is not always easy to detect nefarious activity or even find a missing plane, so what can the US and other countries do to improve their ability to monitor the high seas? The answer is underwater drones, such as the Wave Glider technology utilised by Liquid Robotics, where they sit either on the surface of the sea or deep underwater and send information wirelessly via satellite back to the cloud in real time. Liquid Robotics is a US-based firm founded in 2007 and launched its first drones in 2010. In just five years, the firm has set a Guinness World Record for the longest journey of an unmanned autonomous surface vehicle and was awarded the Economist's inaugural ocean innovation award in June. "Typically, countries fly over or drop a sonar buoy into the ocean to detect submarines. It's very expensive and it's like hunting for a needle in a haystack. 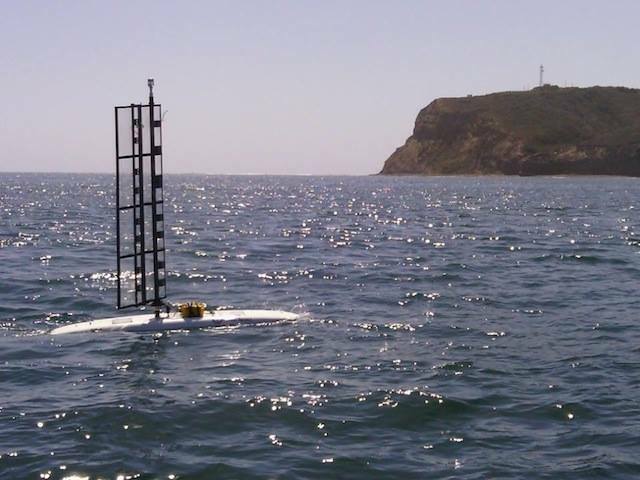 At a hundredth of the cost, we can have a fleet of Wave Gliders detecting submarine incursions using acoustic sensors. We've offering an augmented way to detect submarines for defence of the country," Liquid Robotics president and CEO Gary Gysin told IBTimes UK. According to Gysin, the cheapest vessel a country could use to patrol its oceans would cost $15,000 (£9,800) a day to operate, while deep ocean exploration would cost upwards of $500,000 a day. In contrast, it costs between $3,000 to $5,000 a day to run a Wave Glider; the price goes down the deeper the drone goes into the ocean. "Countries don't necessarily have a large navy fleet or large air force to patrol their seas for illegal fishing, piracy and refugees. In order to patrol the seas with a manned asset, the bigger the ship, the more fuel it needs, and the deeper you go, the more expensive it is," Gysin said. "With a robotics solution, we can detect [submarines and vessels associated with piracy] and then you send the more expensive asset out to go and intercept it, like another ship or an aircraft. So you're using the expensive target to go inner deck on something that's a known target, rather than just patrolling, which is quite expensive." According to Yahoo News, the Wave Glider is being used in classified missions for the Pentagon. However, Liquid Robotics could only confirm it is working with the US Navy and the Royal Australian Navy on defence missions but that it is not privy to what those missions are. Several governments are interested in the solution, and the company is in talks with the Indonesian government to provide Wave Gliders to deal with illegal fish poaching, which is a huge problem in south-east Asia. And while defence is one of the biggest markets for the Wave Glider, the technology is also being increasingly used to provide more accurate weather information for the National Oceanography Centre in Southampton, UK, as well as the US National Weather Service during potentially hazardous weather events, such as an incoming typhoon or hurricane. "Even when ships and planes have to go back to shore for safety, we can continuously transmit information 24/7 from the drone even in the eye of the hurricane and grab information that's not possible to gain right from the surface of the ocean," Gysin said. "We've been through 17 hurricanes, typhoons and cyclones, been in 70ft seas, 170 knot winds and we've been right through the middle of many cat 4, cat 5 hurricanes. We're good at predicting the path of a hurricane or typhoon, but not so much the intensity, so is it cat 2, 3 or 4? Should you evacuate? That's the science part that needs a lot of work." The technology is also being used by scientists at the Scripps Institute of Oceanography to track the movements of tectonic plates in order to improve tsunami early warning systems, with the long-term aim of building a large network of sensors across the mid-ocean ridge of underwater mountains that wrap around the globe. 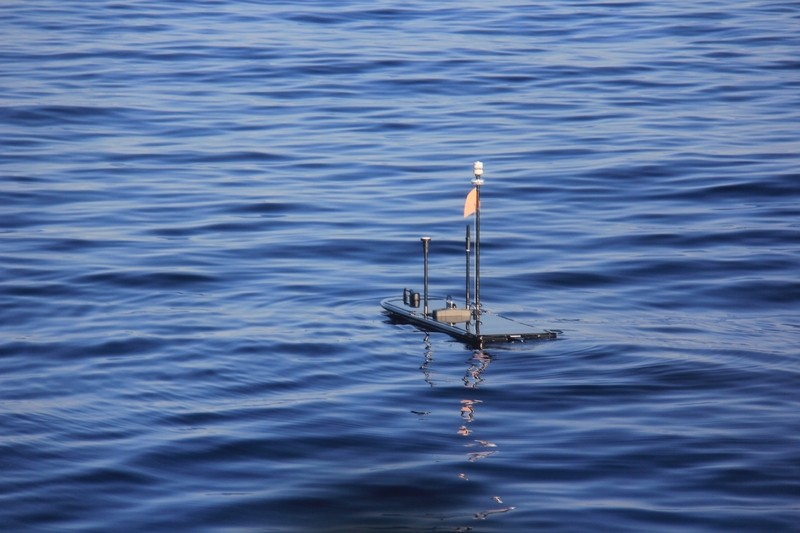 "There is no other ocean robot in existence that collects data, that moves in the ocean all the time, anywhere. The ocean is so important to us and there's a gap, that's a key problem we're solving that has not been solved today," Gysin said. "We're providing info that you can't get today because it's too expensive or there's bad weather. Most companies rely on satellites for weather info before you commence a shipping operation. A satellite is far away and it uses models to predict what is happening, whereas we're actually in the water getting actual results." 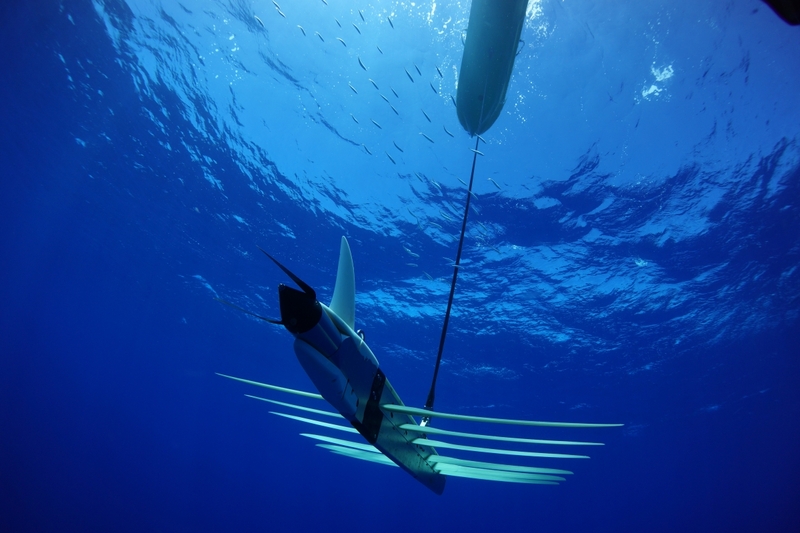 The Ocean Aero Submaran represents the next generation in unmanned ocean systems -- the creation of autonomous, highly persistent, energy scavenging, wind/electric unmanned vessels packaged in a small, man-portable configuration. "Submaran" -- a new class of Unmanned Underwater, Surface Vessel (UUSV). The US Department of Defense (DoD) has contracted Ocean Aero to develop a hybrid unmanned underwater/surface vessel. Through its Rapid Innovation Fund (RIF) the DoD is seeking a long-range, high-endurance hybrid unmanned underwater/surface vehicle that can transit for long, open ocean distances on the surface with a relatively low signature and then submerge to avoid surface traffic. The platform will be used for intelligence, surveillance, and reconnaissance (ISR) operations. San Diego-based Ocean Aero has announced that its solution will build on work undertaken for the company's Submaran vessel. In its surface configuration, Submaran uses wind power as its primary propulsion method, supplemented by electric motors. Solar panels mounted on top of the hull generate the electricity for the motors and payload. For submerged operations the wingsail folds backwards and propulsion comes from a buoyancy-changing glider unit and electric thruster. The Ocean Aero Submaran™ S10 is the first wind and solar-powered surface and sub-surface vessel designed for extended autonomous ocean observation and data collection. Equipped with a unique retractable wing-sail that folds down for submerging, the Submaran S10 can dive ten meters and remain under water to avoid poor weather conditions, traffic or detection. Easily transported by land, sea or air, the multipurpose Submaran™ S10 has the power and payload capacity for a wide range of sensor systems. The combination of solar and wind power enables Submaran deployment for extended periods of time in extreme conditions. According to a company spokesperson, two Submaran prototypes have already been developed and tested as well as a pre-production vehicle, with a second under construction. The spokesperson said that the company intends to build three pre-production vehicles and demonstrate their abilities to customers; production and sales are scheduled for early 2016. To date, the programme has demonstrated the vessel's ability to sail under remote control and autonomously, and has also successfully submerged under computer control in a tank testing environment, which included trimming up and down and resurfacing. Operationally representative tests are scheduled to take place in the next few months. The spokesperson said that Ocean Aero intends to meet or exceed all of the parameters listed in the RIF's Broad Area Announcement, which outlined that the system developed should be capable of operating at average speeds of in excess of 10 kt and 2 kt for the surface and submerged modes respectively, and have a range of 3,000 n miles. For underwater operations, a maximum dive depth of 500 ft has been stipulated, combined with the ability to travel up to 200 n miles at any depth; the system should also be able to position itself near to the surface with only its sensors, communications equipment, and other small masts above the water. It is envisaged that the primary payload will consist of a minimum of two canisters that have a diameter of 21 in (53 cm) and are 60 in (152 cm) long, and which have dry and wet weights of 600 lb (272 kg) and 200 lb (90kg) respectively. A further requirement is for a dry payload bay with a minimum volume of 4 ft 3 . The system should be able to provide payloads with a steady state power supply of 50 W which can periodically be increased to 100 W.
The RIF document also stipulates that the system should be transportable by standard 20 or 40 ft equivalent unit containers. Submaran is an Unmanned Underwater, Surface Vessel (UUSV) concept powered by wind and solar energy developed by Ocean Aero. The Submaran SP-1 prototype (pictured above) was tested off Point Loma, California in 2014. While the company has yet to integrate any customer payloads, the spokesperson said that they have demonstrated the ability to do so and equipped the platform with a number of sensors, including an anemometer, camera, speed sensor, and GPS. The spokesperson said that the biggest challenge in developing the system is long-range underwater navigation. "Though we do have an inherent advantage on the surface of the water and in our ability to resurface, the challenge of navigating underwater is something we are constantly working to improve. Long-range underwater navigation becomes a bigger challenge when we deploy in poorly surveyed waters, which presents the possibility of striking submerged, uncharted objects. [But] we are confident in the vessel's collision-avoidance abilities with respect to moving objects, such as ships." 'Smart' features of the system are set to include what the company calls "heavy weather awareness and avoidance" - the latter element of which sees the system submerging. It will also be capable of working as part of a network of systems. Multiple deployment methods are also slated for the system, as well as shore- and ship-based launches. An aerial delivery method is also under consideration. Apart from the military ISR function, Ocean Aero is projecting a number of commercial, scientific, and security missions for the system, including oil and gas exploration, environmental monitoring, and coastal law enforcement, among others. The RIF contract is valued at over USD2.3 million and is scheduled to last for two years, the last four months of which are set to be primarily focused on testing and acceptance work. The Datamaran has a self-righting "active" hull and is mostly made from styrofoam. The "Datamaran" got its name from a typo. Still, the sailing drone developed by Massachusetts-based startup Autonomous Marine Systems was named fortuitously. The catamaran has a rigid wing-sail with a "passive mechanical system"
that allows the boat to self-steer. "Datamaran" captures what the vessel does in gathering ocean intelligence, from weather conditions and pollution to the effects of climate change. The catamaran has a rigid wing-sail with a "passive mechanical system" that allows the boat to self-steer. It's also self-righting through an active hull—see the video below. Without a heavy fixed hull, it weighs 150 pounds and can be lifted (or actually just thrown) into the water by two people. Aside from whatever sophisticated sensing equipment you might want to put onboard, the boat isn't fancy. "We didn't set out to make the best boat," says AMS cofounder Eamon Carrig. "We set out to make the least boat for the job." The drone can take direct measurements of salinity, temperature, acidification, and track weather conditions--for instance if there's a hurricane or tsunami building in the far-Pacific. AMS is based at Greentown Labs, a hardware-focused business accelerator and workshop space in Somerville, outside Boston. It plans to offer services like data collection and analysis. The drones can go out for six months at a time and are good for assessing the dynamics of a particular area (the Datamaran can "station-keep" within a 50-meter radius). Unlike floating buoys, they're not pushed by the currents. And unlike fixed buoys, they don't need to be towed into place at vast expense. Carrig says it can cost $100,000 a day to put out a buoy delivery ship. AMS can do the same job for an order-of-magnitude less, he says, and with no danger to sailors or use of diesel fuel. The boat is powered from solar panels and the wind. Each Datamaran is a node in the AMS network. Using peer-to-peer communication, and redundant host systems on land, swarms of Datamarans can self-organize for maximum efficiency in carrying out their mission. This capability allows for ocean surveillance of unprecedented richness and responsiveness to changing conditions. There is a big need for deep ocean data. Satellites provide a limited view of the water. The drone can take direct measurements of salinity, temperature, acidification, and track weather conditions—for instance if there's a hurricane or tsunami building in the far-Pacific. The Datamaran sounds like a useful addition to the fleet.